The other day my friend and I crashed a live mummy exhibit. It was the music that drew us. My friend Rick was visiting from the States, and he was sitting with my husband and me over dinner, when we became aware of music competing with the CD we were listening to. When the CD ended, we had no choice but to listen. We heard operatic music, identifying it as the theme every Italian would know - the choral anthem from "Nabucco". Rick loves Italy and adores opera. We had no choice but to follow the music. You probably know the piece, that thrilling chorus from the opera about the Hebrews slaving under Nebuchadnezzar in Babylon. I don't know if you'd hear classical music in America blazing from outside somewhere, but it is conceivable here in Germany, especially in convivial Cologne, where there is lots of noise. So Rick and I rushed outside to find out what this was all about. I thought, maybe there is a village festival going on that I knew nothing about. Maybe there will be fireworks! So we followed the sound, walking around the block until we came upon an ancient half-timbered house with torches and candles blazing in the garden, and loud music blaring for half of Cologne to hear. Germany has ordinances about just about every aspect of life. For instance, you aren't allowed to wash your car, and you can't mow your lawn on a Sunday. You also can't make a peep after 10 pm. Here we had a clear infraction of the the right to peace and quiet. But no one was complaining! In fact, there seemed to be a crowd gathering around this house. I, eager to please my guest, ventured to ask the nearest person I could find what was going on. "It's a mummy exhibit!" He explained. "A mummy exhibit?" "Of course! Don't you see the sign here?!" And there it was in black and white, a sign with an arrow pointing to the garden for the mummy exhibit. He went on to say that someone was celebrating his fiftieth birthday, hence he qualified as a mummy. Since the sign was hanging on the wall for all to see, he explained, we had the right to venture in and have a look. So we did. We discovered a huge party going on in the garden, with candle-lit pagodas, hanging colored lanterns, and torches planted in the ground. It was quite romantic. There must have been a hundred people there talking, laughing and filling plates from tables in pagodas where food was being served, and grabbing drinks from a table with bartenders. Over on our right we were stunned to see a group of solemn, pompous-looking people dressed in turquoise and gold, with turquoise headdresses and painted eyes. I believe we must have walked into a time warp, Americans in Germany, suddenly finding ourselves in a jumble of Egyptian Pharaos, and listening to Italian music about Jews in Babylon! We heard a speech in German about the mummy celebrating his birthday, welcoming his guests to this historic event. The music started again and the Pharaos solemnly marched away from the garden, carrying a six-foot tray with long silver handles. I leaned to see what was on the tray - nothing but a hundred little tea candles! Was this how they preserved mummies? 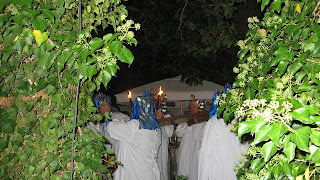 Like the Pied Piper's little children, we followed the Pharaos out of the garden onto the street. One by one the headdresses came off, revealing modern-day men and women of Cologne, thirsty for a beer. They were not disappointed. One of the bartenders rushed to them with his much smaller tray filled with slender Kölsch beer glasses, losing no time in quenching their thirst. Somehow, they must have forgotten us party crashers, so we left the mummies, walking back into the 21st century.